It is aptly said by our Honourable Prime Minister, Mr. Narendra Modi, “Maana ki andhera ghana hai par diya jalana kahan mana hai.” To enlighten the future of our young generation, Mr. Vishesh Goyal, CEO and Chairman, MeetCareer has taken an initiative in the field of education by establishing MeetCareer, India’s best edu-job portal. We are making an effort to endow with the best career opportunities to the talented minds of the nation. It would be our good fortune if in this process we can make changes in the lives of millions of students. 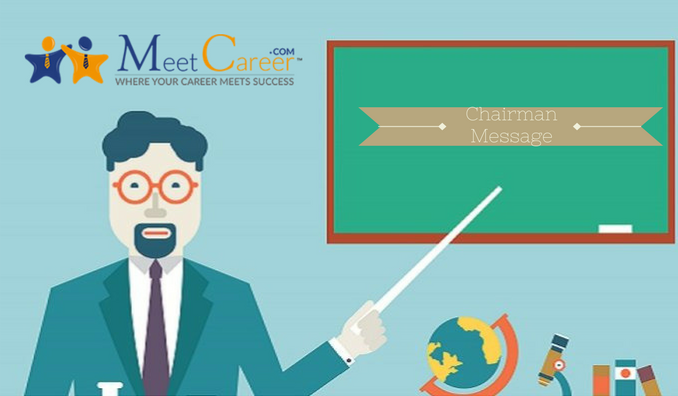 Read more on what Mr. Vishesh Goyal has to say about MeetCareer in the Chairman Message section on www.meetcareer.com. To get free career counselling from our experts, book your appointment are 011-45034008/09. Hurry!